At Thompsons Horse Centre we specialise in teaching you to ride on either your own horse or one of our well-schooled mounts. You can also come on a casual basis and hire our facilities. 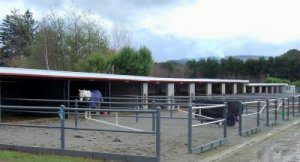 We also offer top class facilities for grazing, and livery horses. We have an on-site registered qualified farrier. Nestled amongst beautiful tranquil landscapes, we are situated in picturesque Mangaroa Valley, five minutes from Upper Hutt City or just a short 35 minute drive from Wellington city.